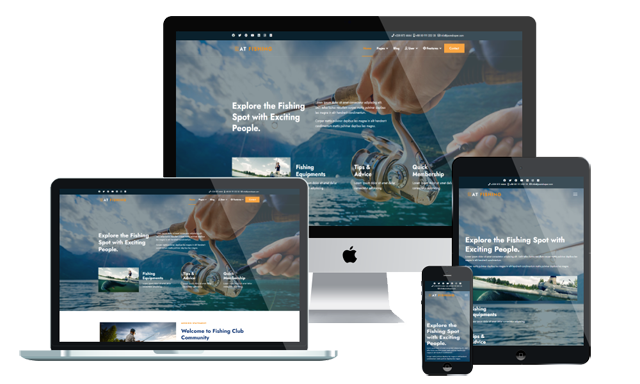 AT Fishing is Responsive Joomla template that targets for fishing club. Fishing Joomla Template will make your business stand out from the crowd. It builds on powerful framework with completely Bootstrap CSS Framework, Support Font Awesome, K2 extended style. Fully customizable and highly responsive, they’re tailored for the needs of business professionals. And at prices that won’t break the bank, they’re quite a catch. Pick from the available colors and Google Fonts to reflect your unique style. Sleek parallax scrolling effect and other responsive animations will make your website appealing to all your clients. And with Google Map integration, they’ll be sure to arrive on time for that fishing expedition. Across-the-board responsiveness means our fishing store website themes remain smooth on both mobile and tablet platforms. That means your clients can take you and your services anywhere, be it on land or out to sea. Once you’ve chosen your favorite template from our rich portfolio, it’s easy to make it your own.